The Union Government has formulated ambitious water conservation scheme” Atal Bhujal Yojana “(ABY)to tackle ever-deepening crisis of depleting groundwater level. The Rs 6,000-crore will be piloted under the Ministry of Water Resources, River Development & Ganga Rejuvenation. It is awaiting cabinet’s clearance.The schemeafter Cabinet’s clearance will soon be launched in water-stressed states: Gujarat, Haryana, Karnataka, Maharashtra, Uttar Pradesh, Rajasthan and Madhya Pradesh. It will cover 78 districts, 193 blocks and more than 8,300 gram panchayats across these states. Centre will support half of the total project cost and rest of the budgetary cost will be shared by the World Bank. The objective of scheme “Atal Bhujal Yojana” is to recharge ground water and create sufficient water storage for agricultural purposes. It also focuses on revival of surface water bodies so that ground water level can be increased, especially in the rural areas. It will give emphasis to recharging ground water sources and ensure efficient use of water by involving people at local level. -The Centre has formulated an ambitious water conservation scheme to tackle ever-deepening crisis of depleting groundwater level. Rs 6,000-crore Atal Bhujal Yojana (ABY),This scheme will help those who are in need for constant ground water supply especially farmers who have been hard impacted by acute shortage of ground water for past several years. 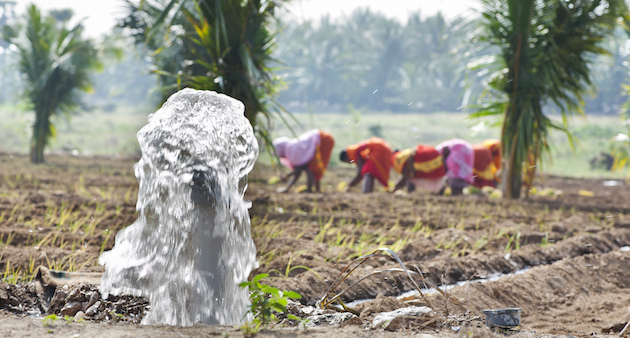 Its focus is primarily on involvement of communities and convergence with different water schemes. -The scheme Atal Bhujal Yojana would seek to bring in innovative and successful practices to revive water bodies, improve ground water levels as well as conserve water, Minister for Water Resources, River Development and Ganga Rejuvenation Nitin Gadkari said in the Lok Sabha during Question Hour. -The government is urging the Finance Ministry to approve the funds for the scheme. Once funds are approved, the Centre will support half of the total project cost. Rest of the budgetary cost will be shared by the World Bank. -The Scheme will focus primarily on the involvement of communities and convergence with different water schemes.Its major component is making society responsible and bringing about behaviour change to manage groundwater resource. It will help improve overall outlook towards water resource. -Researchers at the Centre for Science and Environment (CSE) point that the project will be undoubtedly useful to increase groundwater levels. Involving communities is one of the best parts of the scheme.